This artist's impression shows an overview of the transiting planet HD 209458b. 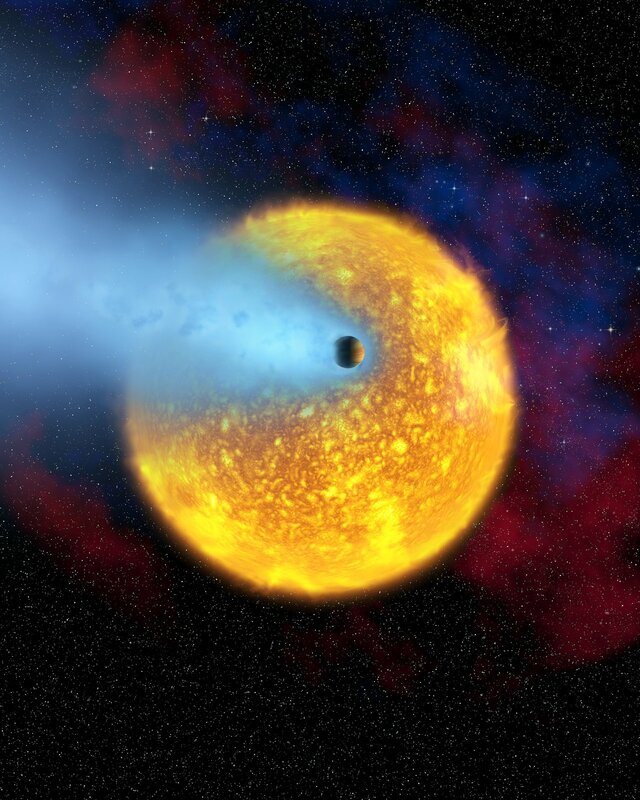 Using the NASA/ESA Hubble Space Telescope, for the first time, astronomers have observed the atmosphere of an extrasolar planet evaporating off into space (shown in blue in this illustration). The planet's outer atmosphere is extended and heated so much by the nearby star that it starts to escape the planet's gravity. Hydrogen boils off in the planet's upper atmosphere under the searing heat from the star. HD 209458b belongs to a type of extrasolar planet known as 'hot Jupiters'. These planets orbit precariously close to their stars. They are giant, gaseous planets that must have formed in the cold outer reaches of the star system and then spiralled into their close orbits. This new discovery might help explain why 'hot Jupiters' so often orbit a few million kilometres from their parent stars. They are not usually found much closer than 7 million kilometres, as is the case for HD 209458b. Currently, the current closest distance is 5.7 million kilometres. Hot Jupiters have orbits that are as brief as 3 days, but not shorter. Perhaps the evaporation of the atmosphere plays a role in setting an inner boundary for orbits of hot Jupiters.